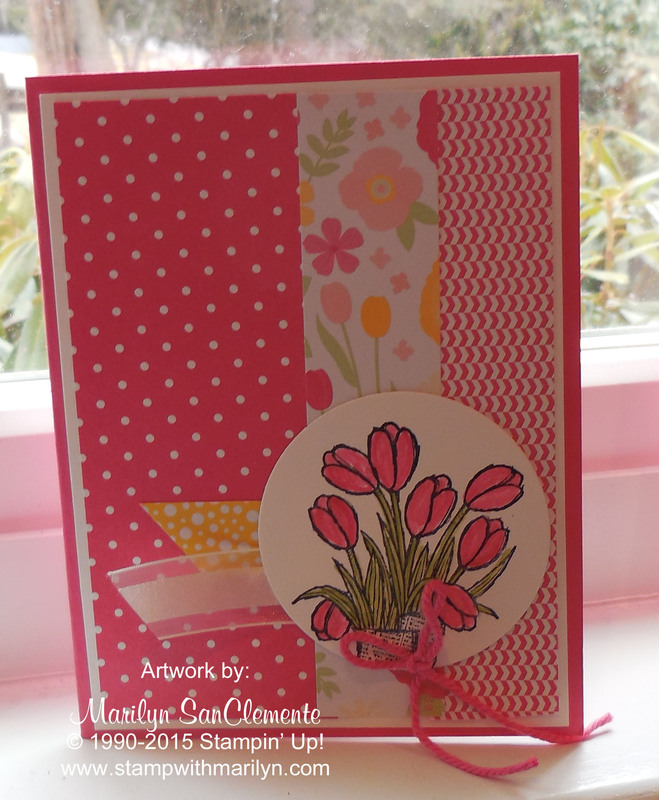 Marilyn SanClemente April 7, 2015 April 7, 2015 All Occasion Card, Mojo Monday Sketch Challenge, Occasions catalog, Spring, Stampin' Up! 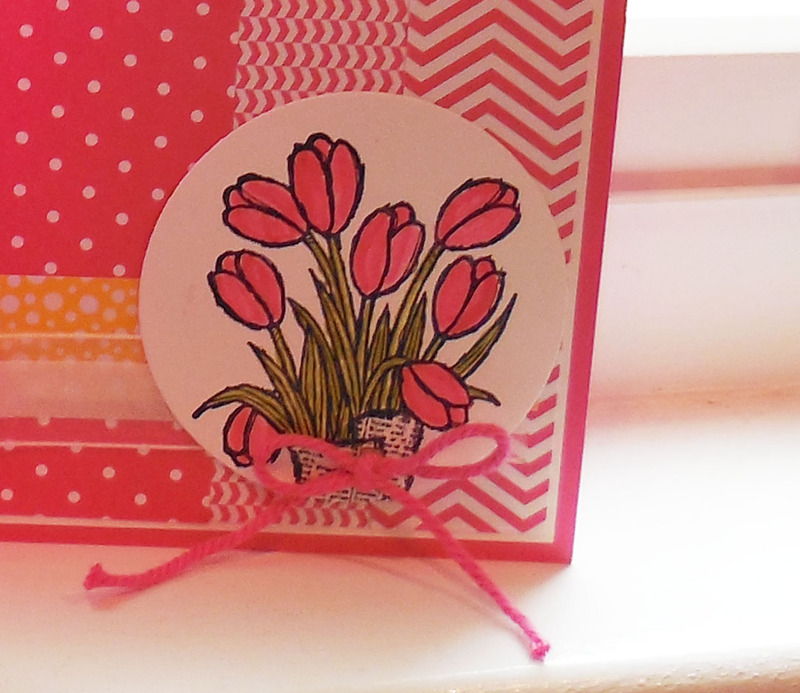 Today I have a handmade all Occasion card that was designed with the Stampin’ Up! stamp Love is Kindness. 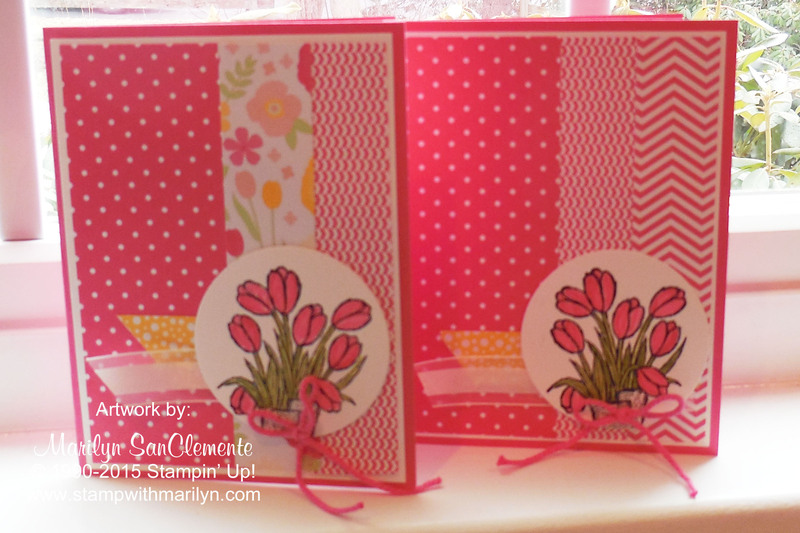 The inspiration for this card came from this week’s Mojo Monday sketch challenge. I love Sketches and find that is the easiest way for me to work on design of a new project. To begin, I look at the focal point of the sketch and then select an image that I think will work with that focal piece. Next I like to select a Designer paper and then pull out the coordinating colors that go with the Designer paper. One of the advantages to using Stmapin’ Up! products. 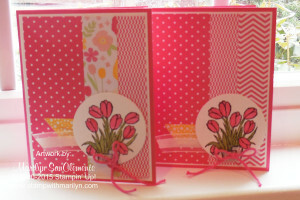 All the designer papers coordinate with Stampin’ Up!’s 50 exclusive colors. In this case, I choose the color of Strawberry Slush and the coordinating DSP stack. I also choose the All Abloom DSP stack which has Strawberry Slush papers also. 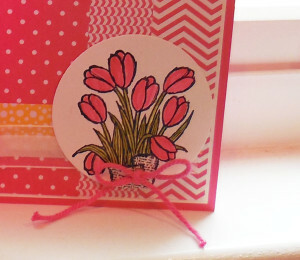 The focal image of the tulips is stamped using Black Staz-on ink and colored with a blender pen and the inks. My first version of this card was made with 3 patterns from the In-color DSP stack with Strawberry Slush. You can see the 3 patterns behind the Tulip image to the right. After I finished the card, I realized that I wanted to try again but bring in another coordinating piece of DSP from the All Abloom DSP stack for the middle strip of the background piece. For more information on this card check out the video that I recorded HERE. This is so pretty….love the colors and patterns!